Here is a shot of the Eastbourne Roadliner, that Diesel Dave referred to under the Halifax Corporation – Daimler Roadliner on the 4th of January heading. Cummins earned such a bad reputation for its V6 engine (and the corresponding V8) that it is a wonder that it survived as a company. For years, Cummins used its own fuel injection system in which the pump pressurised the fuel lines but the injectors were individually actuated by a separate camshaft. It is rumoured that Cummins devised this system to avoid paying royalties to the inventors of the in line fuel pump, the German Robert Bosch company. In Britain, Lucas/CAV manufactured pumps under Bosch licence. The Cummins system rendered the engine unresponsive to modest movements of the accelerator – the engine was either "on" or "off". I never drove a Roadliner, but I have driven Lynxes and Olympians powered by the later L10 engine, and they were crude and rough. Proper fine control of the engine was impossible. The present day "B" series engine and its derivatives used in ADL buses was originally a design of the Case Corporation, and does not have the traditional extreme Cummins characteristics. I think Cummins survived (at least in Britain) because the passenger and freight markets don’t talk to each other much. The V engines may have been as bad in both, but Cummins were also building inline engines which seem to have been very successful, and which marked the beginning of the end of Gardner supremacy in ERF and Atkinson trucks among others. What I find more surprising is the way the bus industry embraced the L10 after its earlier bad experiences. Cummins came badly unstuck with some diesel-powered trains a few years ago, with them having to replace the unreliable engines at some cost to themselves. Whatever merits the L10 may have had as a lorry engine, and one can but reflect upon such "merits" in the ultimate fates of ERF and Seddon Atkinson, it was not a good bus engine, having crude response to accelerator pressure resulting in very rough and jerky ride standards. Along with the Seddon Pennine IV, I would nominate the Cummins powered Lynx as the most horrible vehicle type that I have ever driven. Likewise, the Cummins Olympian was not a patch upon the sophistication of its Gardner equivalent. The L10 was enlarged into the 10.8 litre M11, and early tests with this engine proved that it was totally unsuitable for bus work. It is noteworthy that, along with ERF and Seddon Atkinson, the M11 has now virtually disappeared from the road haulage scene. The smaller "B" series used initially in the Dart and later in ADL ‘deckers as well is a much superior design. Rolls-Royce made the Eagle Diesel engine for lorries, which was not too good, and metamophosed into a Cummins engine on takeover, in the end, also not very good, I believe. Was the Eagle ever fitted into buses. I believe it was rather large. I am surprised at the comments about the Cummins L10 engine. My fleet took a batch of L10 powered Olympians which I viewed with some trepidation. However they matched the 6LX engined Fleetlines they replaced almost exactly in fuel consumption despite having rather more go about them. After an initial problem with cylinder head gasket failures (quickly modified and repaired by Cummins) reliability was exemplary and they were a delightfully simple to work on. Very different from their successor vehicles fitted with the Swedish engine – needed a fuel tanker to follow them round each day and not nice to work on. As for drivers’ comments about the L10, well there was nearly an international enquiry each time one of the fleet worked from the main depot after any repair work had been completed. The ones they couldn’t stand were some early Gardner Olympians with Voith transmission. The comment about replacing engines in diesel trains, I’m pretty sure this referred to trains built with MTU power units as the Cummins NT14 had given excellent service in BR built trains. 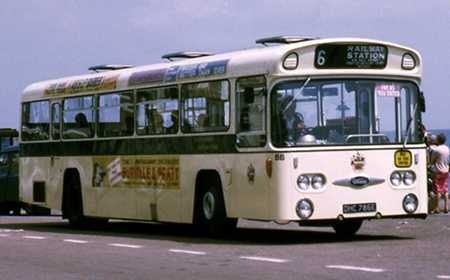 Looking at the photo of the Eastbourne bus I am struck that it would not look out of place amongst todays single deckers. It looks smart (the livery helps there), modern, well proportioned and purposeful. What a pity the Roadliner didn’t succeed as the concept was excellent. Still, neither AEC nor Leyland fared much better with early rear engined single deckers. SYPTE specified Rolls Royce Eagles to special order for all their Dennis Dominators and all their MCW Metrobuses. This only ended when they began a period of single deck purchase and operation with the Volvo B10M Alexander PS era. One must therefore assume that they were happy with their Eagles – which all had full service lives. Roll Royce (Eagle) engines were bought by Perkins – not Cummins. (I believe they eventually, by a series of buy outs, ended up in common ownership – but the Eagle became a Perkins). From what I remember reading at the time, I’m pretty sure the Cummins L10 was designed specifically as a bus engine, and wasn’t used in lorries. As for the Rolls Royce Eagle, I’ve heard exactly the same about that as Ronnie says about the 8-cylinder Gardner – that it was designed for marine use and wasn’t much good on the road. SYPTE chose it for extra muscle, which they felt they needed, and that being the case, they probably felt they had no choice but to stick with it. With the number they had, they would at least become world leaders in making it work! Bristol Omnibus also used five or six Rolls-Royce powered Metrobuses in Bath. Anyone familiar with Bath and Sheffield will quickly see the connection! The Gardner 240 bhp 8LXB was widely and successfully used in lorries; its problem was that it was physically large and very expensive. The 6LXB/C/D, even in turbocharged form, increasingly became unable to meet minimum power to weight requirements in the the haulage market. To compound the problem, British lorry manufacturers always charged a premium over and above the extra cost for Gardner- in his "Gardner" book, Graham Edge illustrates that the extra cost for a Gardner 8LXB of £1367 became a mark up of £3000 in the ERF sale price. In the straitened economic circumstances of the 1980s, the much cheaper Cummins L10, which was certainly widely installed as standard in Seddon Atkinson, Foden and ERF chassis, became the preferred option. I am not challenging the reliability or fuel economy characteristics of the Cummins, but I do hold fast on its unsatisfactory throttle response features. The Wikipedia entry on the Roadliner says, "The Cummins V6 had that manufacturer’s patented intermediate-pressure fuel pump and governor system, supplying the fuel to open-cup injectors through internal drilled fuel galleries, four-valve cylinder heads and tappet-actuated injection. This made the engine less than suitable for slow speed stop-start work……". The same characteristics were carried over into the L10. Taking up Ian Wild’s point about a certain "Swedish" ‘decker engine, the two Gardner Olympians outstationed at Ramsey in the Huntingdonshire Fens could complete two days if required on a tank of fuel. The Volvo Olympians that replaced them not only drank fuel at a prodigious rate, but were equipped with smaller tanks, and had to be filled up twice in the same day. They also possessed the endearing characteristic of blowing out all the power steering fluid. With the Voith three speed transmission, which required the engine to scream up to near maximum revs in the lower two gears before changing up, they were, in my view, despite their powerful performance, decidedly less than impressive. I have also driven TL11 powered Olympians, which were smooth, civilised machines. Given a more enlightened political approach at the time, the TL11 had development potential that could have been reflected in a much stronger present day British engineering industrial base. Being an enthusiast rather than an engineer, I have found Roger’s insight of the operational drawbacks of the Cummins L10 quite fascinating. Wasn’t this the standard engine fitted to the MCW Metroliner 3 axle double deck coaches new in the early/mid eighties? On the subject of reliability, a survey taken in 1979 by "Transport Engineer", the journal of the Institute of Road Transport Engineers investigated the maintenance costs of 9488 heavy lorries, fitted with 16 different engine types, operating at 30/32 tons gvw. This entirely independent review showed the 6LXB at the top of the list, costing just 0.265 pence per mile to maintain, with the 8LXB in close second place. This survey predated the introduction of the Cummins L10, which appeared in 1982, but the earlier Cummins straight six ranges occupied third and sixth places in the list, very creditable indeed. Doubtlessly the later L10 would have returned similar figures. Interestingly, the Leyland O680 and 510 came fourteenth and fifteenth respectively, just above Scania, the costs for which were six times those of the 6LXB. One can only reflect upon the figures for contemporary engines, with their high turbocharging pressures and costly emission control systems, together with their propensity to drink fuel like a dipsomaniac. I recall from my days on Southdown just after it’s sale to Stagecoach one of our depot fitters being less than impressed by the Gardner engines lack of oil tightness when fitted to a batch of recently delivered Olympians when compared to the Volvo D10M’s bought by the independent Southdown. He said you could get to work almost straight away on the Volvo when necessary with only a minimum of cleaning, whereas the Gardner took some time to get clean enough to work on. This is one of the trio of Roadliners operated by Eastbourne Corporation referred to by Diesel Dave in his comment on Roadliner CVC 124C under the Halifax Corporation heading. 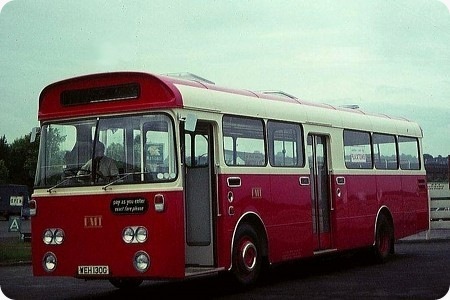 These were the only Roadliners bodied by East Lancs (although Chesterfield had ten built by closely associated Neepsend Coachworks). The photo was taken on 3rd October 1975 when the vehicle still looked very smart but probably only had a short time left in the fleet. The 30,000 mile engine life mentioned by Dave was similar to that which we obtained at PMT although the half dozen allocated to Longton Depot did rather better as did most other types. This was nothing to do with the operating terrain at Longton but everything to do with the quality of maintenance achieved by Depot Engineer Frank Ling. This photo took me back to our June 1975 annual holiday when we stayed in Eastbourne for the first time – there had been a couple of day trips previously. I discovered that you could buy a £1 travelcard which allowed unlimited travel from Sunday to Saturday. Sadly we were there from Wednesday to Wednesday which meant I had to work hard to get my moneys worth. I managed 43 trips in four days which enabled me to sample a number of unfamiliar vehicle types. My notes of the time indicate that the exterior noise of the Roadliners was impressive (and I don’t mean quiet) but the transmission seemed unhappy and hill climbing ability was poor. According to Mick Hymans’ recent book, the Corporation was offered an AEC Swift at £2,889 or a Leyland Panther at £3,072 whilst the Roadliner was the dearest at £3,311. The Daimler was chosen because it would not need any steps in the interior. Eastbourne had also acquired ten Panthers and an ex demonstrator Panther Cub but it was a couple of other single deckers that featured in my notes. Looking out of the hotel at about 08:30 I saw No.93, the 1950 AEC Regal III with a splendid East Lancs DP30R body pass by and it appeared to be in normal service. Needless to say, I was at the appropriate bus stop the next day and enjoyed an excellent ride. Rather less impressive was the Regals replacement, No. 94, a Seddon Pennine IV with a Pennine body, also said to be dual purpose but you could have fooled me. On this bus the driver apologised to an elderly female passenger for the vehicles shortcomings and she replied that she and her friends knew all about it’s problems and that it wasn’t the drivers fault. Either she was a closet bus enthusiast or else it really was a bad buy. The Regal still survives but the Seddon became baked bean tins long ago. How right you are, Nigel, about the Seddon Pennine IV. I would nominate this type as the most primitive abomination that I have ever driven. Back in September 1977 I had to take KWW 901K, which had a Seddon B56F body, from Gomshall in Surrey up to Yeates in Loughborough. The racket from the Perkins 6.354 engine was absolutely deafening, the suspension would have disgraced a London B Type, and the steering was frighteningly imprecise and needing constant correction. The Bedford YRQ that I brought back in exchange seemed like a Rolls Royce by comparison. The Pennine IV was little more than a basic lorry design with a bus body on it. I must initially admit to having been an employee of LG&S,CECO, SA and also being involved with Neoplan. I just hope that facts never get in the way of a good story. Re: Cummins, The Darlington V6/V8 (Val/Vale)engines were not fitted into buses in the UK, the larger Krupp built V6 (Vim) was. The Vim was used in the Guy truck chassis (200 HP) and, was acceptable in that installation. The V6 Roadliner engine did not endear itself to customers, it was not designed to spend most of its life idling and I suspect the installation was not the best either. The L10 engine was theoretically designed to compete with the LXB/CT range, capacity wise, but CECO never built designs to suit only one market sector. The Cummins PT system was produced as an alternative to what GM offered in their two stroke engines. The PT fuel pump in a Cummins is ‘load sensitive’, it is not an ‘all road speed governor’ type as supplied by the ‘Bosch’ designs used in European engines. The Pennine 7 chassis was an equivalent to the Leopard, like for like the HLXB was usually 2 mpg and upwards, better on fuel, with lower overall life costs. The demise of Gardner, as with all the other UK manufacturers was self inflicted mainly by a lack of foresight by their managements. On one trip to OZ I spoke to a truck operator, once Atki but now 100% M-B. Why Mercs? "Because I wanted Air Con and a double skinned roof, my one way trips can be 2000 miles with extreme temps one side to the other. M-B listened and actioned my request Atki’s did not" For Atki insert any UK manufacturer of your choice, not a happy story but reasonably factual. I am also ex-Gardner, like yourself, and agree with your reasons why UK manufacturers, however good in their time, because of bad attitude and complacency they could not survive. On your comment about the Roadliner engine weaknesses. I worked at Daimlers for a short time involved in warranty repairs prior to Blue Bus getting their new Roadliner. The biggest issue which blew the engines was over-revving, not idling. Black and White coaches dropped valves regularly because of over-revving, which caused the valves to bounce. The design of 4 valves per cylinder with crossheads was not common at the time and adjusting the tappet clearances regularly were critical in that V6-200 engine. There were two clearances, between the rocker and crosshead, and the crosshead and each valve. If the clearances were not kept to specification the gaps eventually opened up, and when the over-revving valve bounce occurred the crossheads had room to slip sideways hitting the valve, then the collets flew out, and the valve disappeared down through the piston at high speed. Result, bus stops suddenly at side of road with a big pool of oil, piston has probably broke the crankshaft or crankcase, and customers inconvenienced. Other weaknesses I encountered were the throttle sticking wide open – and the Roadliner coach was a fast vehicle for the era. Squeaky bum moment if it happened! Also, the engine/gearbox mounting did not support the gearbox sufficiently so the support casting cracked where the gearbox fastened to the engine, and it could land on the tarmac if not noticed early enough! The Blue Bus Roadliner did not blow up in the 3+ years while I looked after it, and it was a pleasure to drive. In the years from the mid 1950s, the Gardner company was run in an exceedingly autocratic style by Hugh Gardner, whose engineering capabilities were excellent, but whose intolerance of alternative points of view was extreme. In particular, he hated the concept of induction pressure charging, and forbade any work on the application of turbocharging to Gardner engines. With no new designs in the offing, Gardner engines increasingly fell behind in the ability to deliver the bhp outputs consistent with increasing lorry payload weights, and, by the time that Paul Gardner was eventually permitted to embark upon a programme of turbocharging applications, it was too late. The later Gardner designs produced under Hawker Siddeley ownership soon revealed weaknesses that had hitherto been unthinkable in the context of the Gardner name, and HS simply ditched the Gardner company. Those chassis manufacturers that had nailed their colours to the Gardner mast very successfully for several years were forced to look elsewhere for power units, but the outstanding traditional Gardner features of reliability and economy could not be recreated. Having lost their unique selling points, the smaller manufacturers simply died out in the new world of sophisticated continental engineering. A very informative post, Mr Anon, and one which tells the story of so many intransitive bosses who think they know what’s best for the customer. You have to feel sorry for the Paul Gardner’s of this world: his position was invidious. So many companies go from creation to closure in three generations. Your memories of the Roadliner V6 engines are more vivid than mine, but I have to admit putting far more fires out due to the mayhem caused by the Darlington built small V6 and V8’s fitted to the Dodge ‘K’ and Ford D1000’s! The high incidence of failures to Roadliner V6’s was not mirrored by the Guy Big J engines.My comment about the installation also includes the driveline which was outside our remit. I think the crosshead was responsible for many dropped valves when an overspeed condition was underway, i.e. pressing down on the valve retainer thus releasing the collets. Surely why and how it was oversped is the question to be asked of the driver, not the engine? Perhaps I can shed more light on your comments. "JHSG being autocratic", absolutely. e.g. I have a copy of the LXB Sprayer drawing (Injector)’ it states "This drawing is intended solely for the use of Mr JHSG and must not be circulated without his consent". Did my very limited, and circumspect, use of this info result in repeated engine and parts sales? in a word yes. Would he have let me use it outside the company, had I asked him, I leave you to judge. Paul was the Technical Director responsible for the introduction of the 6LXCT/6LXDT/6LYT engine designs. I can assure you they did not lose their unique selling points, but, a lack of funding to ‘debug’ and ‘productionise’ them did not help their introduction into the market. It should be remembered that Hawker Siddeley was at that time in the process of dismembering their group. Perkins bought Gardner in 1986. There are various reasons put forward as to why they made the purchase, but, they did fund the revision of the 6LXDT. The resulting engine, the LG1200,is what had been needed at the start of the 80’s. There were many potential alliances that came to nought, but, mainly due to uncertainty about future ownership and legislative changes the spiral was always downwards. Dismissive one liners, regarding the demise of Gardner, I can assure anyone, are very wide of the mark. I have to admit that hindsight is always 100% accurate, if only we all had a crystal ball to look into before we made a decision! Hindsight is a wonderful thing, but the end result is always the same. I know numerous examples of family members wrecking the efforts of founder members of a company – not the least independent operators. There is a "Gardner" story to tell with a pipe organ builder who for a hundred years was England’s, and one of the world’s, finest only to be wrecked, as it seemed overnight, by the great-grandson. I would also contend that maybe you protest too much over the Roadliner/Cummins. I’m an advanced motorist and take a pride in my driving but surely a manufacturer should make their product driver/idiot proof rather than simply blame the idiot. This is the difference between a Rolls Royce and a Commecon Lada. I am the writer of the comment above attributed to "Mr Anon", and I can’t imagine how my name came to be missed. I am certainly not reluctant to stand by my entries to the Forum. Personal acquaintances of mine will testify that I would qualify for the title of "Gardner’s greatest fan", and I do not dismiss the demise of Gardner in one liners. The 6LXB was the supreme bus engine, especially for double deckers, and its high torque delivery throughout the entire rev range gave buses so powered a road performance better than the nominal bhp would have suggested. Hawker Siddeley tried to rush the new range of Gardner engines into production, and when problems emerged, they simply gave up on the company. Another critical aspect of the Gardner story is the devastating effect of the Euro emission regulations. The traditional Gardner engines could not meet the Euro standards, and sales just dried up. However, it is interesting that modern bus engines complying with the Euro standard (now at Euro 6) deliver absolutely pitiful mpg figures, way behind those reliably turned in by Gardners, and, since matter can be neither created nor destroyed, one wonders just how meaningful the Euro emission targets really are. The chemical character of the emissions might be modified to reduce nitric oxide and nitrogen dioxide levels using AdBlu or similar agents, but more fossil fuel is being burnt to achieve the result. As they say in exam papers – "Discuss". I would be pleased to hear the views of others on this subject. Roger, very few of us would disagree with you. The inability to do anything to a high standard – in any field of work – is probably due to beaurocrat’s supreme ability to churn out initiatives (and clear the forests as well) at such a prodigious rate. We’re all so busy ticking boxes that doing the job in hand is secondary. Because the job is secondary, cutting corners is an easy answer to problems at both design and production levels. Those who would do it properly (Gardner?) take too long and the costs escalate and they price themselves out of the market. QED. How do we reverse this tendency? I fear we may be too late. It is probably only crinklies like us, who remember what a good bus is, who are even bothered. A friend of mine, who died recently and spent many years on Tillings (cab and management), always complained about the junk London was running these days. But so what? The contract will only last five or so years, then the bus can collapse and no one will care. In the last 40 odd years, I’ve driven PSV and HGV vehicles of all shapes and sizes with virtually every type of engine you can name, during that time I’ve had pistons trying to escape through the side of the block, blown gaskets, dropped valves and all the other problems you would expect to encounter in a lifetime in transport, but I can only remember one breakdown where a Gardner engine was the problem, and that proved to be down to water in the fuel so it would be a bit harsh to class that as mechanical failure. I’m a driver not an engineer, and no doubt some more qualified than me will disagree, but in my opinion. best engine – Gardner 6LXB – worst – Leyland 500 fixed head. Please may I make a rather general observation which covers various "threads" and that is that as I have never worked in the Bus industry nor even driven one, I am both fascinated and amazed to read so often about how terrible so many buses were to drive, maintain and operate yet despite this, all modern vehicles seem to attract universal dislike and derision. Purely as a passenger, I can fully appreciate the skills needed to drive older vehicles having been involved in Vintage (pre 1930) and pre War cars for many years so am always impressed by the excellent drivers of preserved vehicles these days. What does surprise me is that to me, a new, reasonably smooth riding, self changing, power steered and braked bus must be much easier to drive yet I read differently..I do notice that most bodywork seems flimsy with loads of rattles and creaks though! My other experience is from 26 years of regular travel in Switzerland where as long ago as 1986, a Mercedes Benz 0303 seemed like the proverbial "magic carpet" and also any Postbus is both beautifully maintained, quiet, powerful and appears very well engineered. Now I do not mean anything to upset anyone but am confused so, what buses were considered delightful and are any of today’s offerings a pleasure to drive? Oh Richard, your mention of Swiss postbuses makes me think of all those wonderful normal-control Saurer’s and FBW’s of the 1950’s. I’m quite sure that needing skill to drive, steer and brake with a bus that gave a sense of pride to drivers in the past, even though many pre-war buses were hardly paragons of virtue, in fact, downright unreliable and unsafe! There was probably more camaraderie among drivers, too. With standardisation and modern driving aids, it all seems routine. I was speaking to a couple of Stagecoach drivers recently for about 10 minutes and they seemed to consider the job a sort of 9-5 office routine. They did prefer the recent models and were glad that the Volvo B10’s were disappearing. For all this, we must beware of wearing rose-tinted spectacles! Being able at soundless gearchanges with a crash gearbox , with 5 secs delay while double de-clutching, would be unbearable in today’s urban congestion! Well Ronnie, I can only agree with everything you said (including the bit about AEC). Ronnie and Chris..thank you so much for your thoughts! I can understand why different vehicles attract diverse feelings..it depends on whether you prefer a driving challenge and are rewarded with getting something "right" or would go for easy and undemanding. I guess that lady bus drivers were quite rare until 10/15 years ago and so the "he-man" controls thought acceptable became rather less so in recent times. What has puzzled me most though is that from comments, the bus manufacturers have not advanced anything like as much as the motor car industry. Around 6/7 years ago my cousin joined First to become a driver and had to do the full training etc. but was aghast at how dreadful the training bus he was told to drive actually was. Sadly I cannot tell you what exact vehicle but I suspect an early Dart or something. He described the steering as being completely devoid of feel and had so much slack that keeping it in a straight line was nearly impossible. The brakes barely worked and the performance from the tired engine was less than a moped. He gave the job up after six months after being set upon by a gang of late night yobs on his last run. Purely as a passenger, I loved the smooth "London" sound of early RM’s, have always appreciated the build quality and sound of nearly all Bristol’s and am fascinated by the variations in older manufacturers…but when you get to the 1970’s maybe I lose inspiration! I do share your recollections on those dreadful Leyland National’s and have never enjoyed a trip on a Dart although we still have some 1994/5’s in service in Bristol so they must last well! Chris…The Postbus is my great favourite and I recall one journey from Grindlewald up to the mountain stop at Bort where the snow was fluffy deep at 2′ deep all the way up with steep drops on the side and sharp bends with the fearsome reverse experience! It was a short wheelbase, narrow body Mercedes fitted with a 9 litre, twin turbo engine, double reduction transmission with four wheel drive and double snow chains…not fast but it ploughed through the snow and up glassy ice without a flinch. The driver wore a very thick flying suit and gigantic leather boots looking like Danny Kay in Hans Christian Anderson. The journey back down was..memorable..but the bus and driver were as sure footed as a mountain goat. Richard, if I can make one further point. Although I have never been full-time in the industry I became an Advanced Motorist forty years ago and gained my PSV sixteen years ago. When you have a stick and left foot pedal it concentrates the mind. You have to think and read the road ahead to make smooth and safe progress. At a time when, albeit part-time/casual, I regularly drove an automatic Volvo B10M, I became aware that it was making me lazy and that the standard of my driving was suffering. From then on, I was more aware and always take more care when driving an automatic but far prefer the 6 speed ZF – one with a splitter is just icing on the cake. If I might add one small tweak to Ronnie’s idea of the perfect bus, with today’s technology it would be perfectly possible to build a semi-automatic gearbox which is NOT open to abuse. The control system would change down automatically if power was demanded at too low an engine speed, and refuse to change down at too high a road speed. Many automatic gearboxes in cars nowadays have a sequential override mode which does exactly that. The over-revving of the Roadliner coach was probably caused by drivers changing down at too high a speed, or using the engine to assist braking, more often than not down hills. The Cummins V design was not as tolerant of this as, perhaps, some other engines were under engine assisted retardation. Indeed, the 14 litre in line 6 cylinder Cummins of the same era was fitted with an engine exhaust brake as standard, and seemingly could accommodate the stresses in its design. John Ashmore – many thanks for the clearest explanation of the mechanical problems that beset the Cummins V6 engine in the Daimler Roadliner. It’s very difficult to find out just what caused this engine to be such a disaster, but you have certainly helped. It’s all so long ago now, but I can clearly hear the sound of the V6 in Black and White coaches in Derngate bus station in Northampton in the 70’s, and the recent YouTube video of the restored Walsall Corporation Daimler CRC6 with that same engine brought it all back. It’s important to remember that the Roadliners were Black and White’s first rear-engined coaches, and a powerful engine at the opposite end of the coach from the driver,which sounded totally different to AECs and Leylands, coupled to an easy-to-abuse semi-automatic gearbox, would have made it very easy for the less-sympathetic drivers to over-rev the engine. No engine protection systems in those days! If you get a few spare minutes, any reminiscences about your time looking after Roadliners would be much appreciated. Some years ago I travelled up the M1 on a hired-in coach: the only identification on the white coach was the word "Cummins". We seemed to arrive in no time- faster than my usual car progress- and when I went to speak to the driver near our destination I remember looking down and the speedo was reading 90 (can’t have been kph with that timing and we were swaying gently from side to side). I said something like "Goes a bit" to which he replied- I remember clearly- "Yes it builds on you". These posts make me wonder if it was a poor old Roadliner- ungoverned, untachoed, unretarded….. misjudged? 130 was the first of the final batch of ten Roadliners (130-139) to be delivered to PMT. They had Plaxton bodies to their standard timber framed design with BET style front and rear screens. Apart from the Perkins V8.510 engine, they were similar mechanically to the previous deliveries although they had the miniature Westinghouse air gear shift with a sixth position to operate the centre doors. The Perkins engine was a vast improvement on the Cummins V6 but did suffer from premature cylinder bore wear causing high oil consumption possibly due to some inadequacy in the air filtration system. The bodies were built with a higher floor level requiring an entrance step (earlier buses had a step free entrance). They were built to the dual door layout then briefly in vogue. 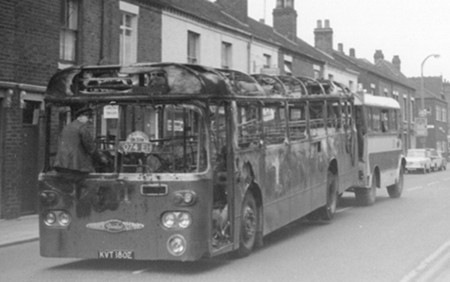 Heated windscreens were an innovation on these buses controlled by a wind up clockwork timer(!!) which quickly proved unsuitable for heavy duty bus operation. Some early deliveries went to Stafford Garage and I recall a report from the Inspector there about the indelicacy of young mini skirted mothers when retrieving their push chairs from the luggage pen which had rather a high rail round it!! 130 was the only one in the batch to have the once standard cream panel above the saloon windows, 131 onwards had all red roofs. 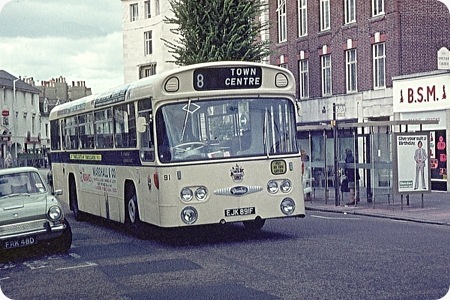 These were also the first new buses not to have the familiar prefix letters to the fleet number (following on from SN1129 which was the last of the short Marshall bodied Leopards delivered the previous year). The above photo was taken on 1st July 1969 shortly after delivery at the weighbridge at Shelton Iron and Steel where we took the first of each batch of new buses for weighing. The driver is Bill Davies who was a Management Trainee at the time. This is a shot of an earlier Roadliner KVT 180E fleet number S1080 being towed into Stoke Central Works shortly after being burnt out at Swynnerton on 25th March 1969 it was rebodied with an identical body to the 130-139 batch returning to service on 1st August 1969. PMT cancelled a further order for Roadliners and substituted single deck Fleetlines but date wise they are outside the time period of this website. I was the first driver to go into service with 138, it was a Saturday afternoon I was based at Newcastle garage and both 138 and 139 were put on the Burslem Silverdale service on the shift change over. I don’t remember driving anything so fast and it was a struggle not to run early on this service, going up hills was not a problem at all with these vehicles it was "just like driving a mail train as they say"
Funny you should mention 138; I’m sure that was the one I saw at Preston North End’s Deepdale ground in the late 1970s having gone there to watch Port Vale play. Only the driver of our Bostock’s coach, who was as big a bus nut as I was, and myself made any comment. It had been sold by PMT to a local independent. I would imagine that it was 137 you saw in Preston as it was latterly owned by Holmeswood Coaches of Rufford … coincidentally the present owners of Bostocks. I remember Roadliners that West Riding operated, on a trip from Horbury to Flockton on the Wakefield Huddersfield service I think the service number was 89 or 86 this particular Saturday was entering Flockton the Netherton Midgley side and there is a sharp left hand bend just as we approached the bend round the corner came lorry cutting the corner on our side of the road the driver could only put the bus as near to wall and trees on our side of the road as he could and hope that we missed each other which we did ,from the front of the bus came a substantial number of choice Yorkshire adjectives expressing the doubt that our West Riding had of the driver of the lorrys parentage and when we got to Flockton the driver removed the assorted foliage from front nearside wingmirror mounting and doors and nearside open windows, as we got off in Flockton our driver said to my mum are you an lad or rite lass, mum said yes the driver said aye lass that were close at least I haven’t scratched it they only got got this b***** yesterday!